The Whakaipo Bay Recreation Reserve is one of the most stunning locations that Living Legends has helped to restore. This former farm is now a very significant recreation area for Taupo and the wider New Zealand community. Bordering the lake and less than 15 minutes from Taupo central, it is seen as a key area to promote recreation opportunities. It is inevitable that this landscape, with its spectacular views across Lake Taupo and entry to the W2K mountain bike trail, will become a national icon within the lands managed by DOC. This beautiful bay had already been a focus of efforts by both DOC and the local community to re-establish native vegetation on what was grazed pasture. 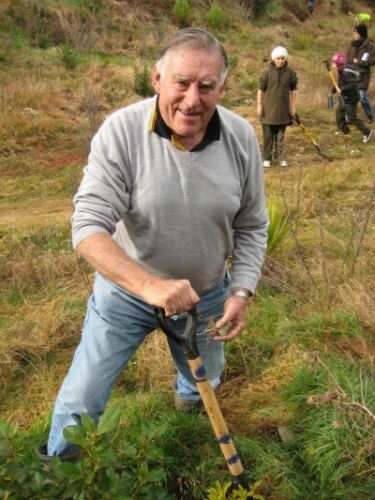 With the help of our Rugby Legend Sir Colin Meads and local volunteers, Living Legends addition of over 11,000 native plants to the area have been established in a well defined valley, significantly extending re-vegetation efforts. 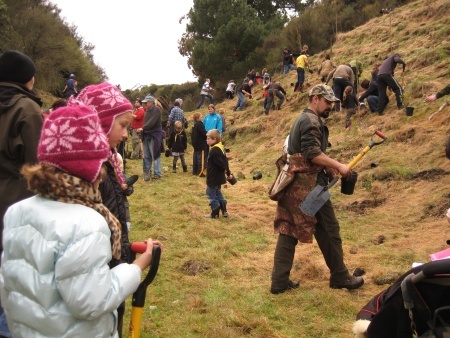 If you enjoyed planting native trees with Living Legends and want to stay involved there is a local group called Greening Taupo whose mission is to improve the Taupo environment for people and native wildlife. 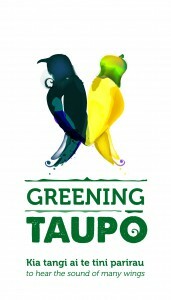 Greening Taupo will be undertaking restoration planting and pest control to create ecological corridors and increase the number of native birds. They wish to build healthy neighbourhoods by increasing the greenery in our community and promoting green urban development, which is good for people, business and the environment. Ko Ngāti Kāpawa te hapū. The Ngāti Kāpawa hapū (family group) of the Ngāti Tuwharetoa iwi (tribe) lived at the eastern end of Whakaipō Bay, where once a fortified pa called Maunganui a Wawatai stood at the top of Tahunatara Point. In later years there was also a thriving pa site at the bottom of the Point. The clay cliff of the Point had tiered gardens, one of a few such gardens in New Zealand during pre-European times. The white clay cliff acted as a solar panel for the gardens giving the gardens a tropical temperature, perfect for growing kumara (a Polynesian sweet potato). The local family were joined at times by nomadic families who followed sources of food in the surrounding area. There is evidence today of kumara pits and a tuwāhu (a place of worship). There are also remains of the front of a whare (house), and worn stone where pounamu (treasured greenstone) was polished. When the lake was lower than its current level, rocks were visible in the bay that had holes that were carved where the anchor of waka (canoes) were tied at bay. In the middle of the bay there was once a wānanga (training ground) for warriors, where they would practice with their taiaha. In the western end of the bay, in the 1800’s a Māori village and its people were sadly buried in a landslide. Te Tuni Point at the western end of the bay was mined for obsidian. The obsidian was traded for pounamu with South Island Māori tribes. Today the hapū have a private area at the western end of the bay below Tahunatara Point where they gather together, and own a boat ramp that the tribe can fish the lake from. Ngāti Tuwharetoa make this area and the facilities available to schools for camps throughout the school year. The Māori history Whakaipō Bay was told by Ngāti Tuwharetoa kaumātua Reverend Sonny Garmonsway. Women’s intuition chose the spot at Whakaipō Bay to be the Girl Guide camp site for the Taupō faction. Margaret Lindup spotted the bay when out on the lake one day, and knew straight away that it was meant to be. So strong were her feelings, she had to let the Lands and Survey Department know of her change in mind, despite the fact a site on Mt Tauhara had recently been put aside for the Girl Guides, including completed fencing. The staff of the Lands and Survey Department gave the women a temporary five year lease for Whakaipō Bay, perhaps expecting another change of mind. But when Margaret’s husband Allan, who was an engineer, along with Warren Gibson, another engineer from Wairakei helped the women to move and build their camp buildings, the Lands and Survey Department knew that it was not a temporary structure! Don McLeod transported the camp building from Waipapa and used his D3 caterpillar tractor to make the road in, which is still the same road used today. The Girl Guides were there to stay. The women won back the respect of the Lands and Survey men when they saw the women hard at work on their working bees. Three women were behind this resurgence of the Taupō Girl Guides in the late 50’s after it had died down for seven years after its 1940’s beginnings. Margaret Lindup, along with Marg Williams and Jill Dawson, together saw “a vision for the women of tomorrow”, and the three women are remembered by a memorial stone placed at the campsite. Their legacy also lives on in the laughter and joy of the girls and women who have been gathering here at Whakaipō Bay since 1964. The Taupō Girl Guides have attended every Whakaipō planting day since the first native tree was planted. 2011 will be their 23rd annual planting. Traditionally after the end of every planting the public have gathered back at the Girl Guide campsite and the girls barbeque sausages for everyone and have a billy boiling away for hot cuppas. Long may this tradition continue. Historical Girl Guide Taupō information obtained from the collection of Margaret Lindup. Locals have been coming to Whakaipō for years for picnics and swimming in summer. It is also a place for fishing, walking, riding bikes and horse riding. The locals have often gathered together to preserve the area for recreation, protecting the bay from urbanisation, motorised vehicle use, and anti-social behaviour by using Taupō District Council security. The W2K is a popular mountain bike and walking track that travels from Whakaipō Bay to Kinloch, attracting 50 to 100 people a day! Volunteers from Bike Taupō took five years building the track in association with the Department of Conservation. The track was opened in April 2008, and a headland loop extension added in 2009, with the total length of the track now being 25km. It was the first mountain bike track to be built in the Taupō area since 1981. The track is to be extended a further 60km down the western shores of Lake Taupō as part of Nga Haerenga, the New Zealand Cycle Trail project, and will become an optional three day ride, with ferry connections. This will be a wonderful asset to the community and local economy. The King Country Rugby Legend is one of New Zealand’s most well known former All Blacks, Sir Colin Meads. He is an icon within New Zealand rugby, and was named the country’s Player of the Century at the NZRFU Awards in 1999. It is a measure of the fame Colin Meads achieved in New Zealand and beyond, that for most of his life he was immediately recognisable by the nickname bestowed on him: ‘Pinetree’. And no nickname was more apt because for nearly 14 years in All Black rugby Colin was a towering presence, one of the best and most inspiring players New Zealand rugby has known in any position. Colin achieved his status as a rugby icon while always playing at representative level for his small, rural-based provincial union, King Country. Growing up on family farm near Te Kuiti, Colin emerged as an outstanding prospect in the mid 1950s and in 1955, when just 19, played the first of his 139 matches for King Country. In his debut against Counties he not only scored a try but he dropped a goal. In 1955 he played in the New Zealand under 21 side which toured Ceylon (now Sri Lanka). Colin played all eight matches, scored three tries and was recognised by the Rugby Almanack as one of the 1955 season’s most promising players. In 1957 Colin was accepted into the All Blacks and taken on the tour to Australia. Colin was made vice captain of the All Blacks for the 1970 tour of South Africa . In 1971 he led an All Black team to a narrow series loss to the Lions. The 361 first class matches in which Colin played from 1955 to 1973 133, including 55 tests, were for the All Blacks. He was the first to reach a half century of tests and while that figure has become commonplace with the growing number of tests, in Colin’s career it was a colossal feat and considerably more than any of his playing contemporaries. After his retirement Colin turned to administration and coaching. He became chairman of the King Country union and during his term the representative side had a lengthy spell in the NPC first division. After selecting and coaching North Island sides he was elected to the national selection panel in 1986. In 1992 Colin was elected to the NZRU council. In 1994-95 he was the manager of the All Blacks, which included the World Cup tournament in South Africa. Colin has received just about every honour the game bestows, including membership of the International Hall of Fame, the New Zealand Sporting Hall of Fame, New Zealand Rugby magazine proclaimed him the New Zealand Player of the Century and in the New Year Honours list of 2001 he was made a New Zealand Companion of Merit.